To celebrate International Women’s Day 2019 we wanted to take a moment to highlight all of the very funny women in ComedySportz Manchester! Below you’ll find some of our player’s favourite photos and a little about themselves and their time with ComedySportz. We’re extremely proud to have had so many talented women be part of our roster throughout the years, delighting audiences around the world, inspiring young people of all genders to take to the stage, and putting an end to those tired old “women aren’t funny though” arguments. Bron reffing a ComedySportz Match at the ComedySportz World Championships! Performing as part of the Women in Comedy Festival at The Frog and Bucket! I enjoy sharing…so hearing an audience laugh or when the penny drops with a workshop attendee, it fills me up with so much joy. In CSz we are a family, there’s so many different dynamics but all with the same goal, to laugh. To make someone smile. To take people away from stressful life. We are inclusive, we represent that in the women we have in our group. We have strong female role models to show the younger generation that everyone can be funny and everyone should be included. Inspiring future funny females at our Halloween Special. I love performing and teaching comedy SO much. Improv comedy helps me to stay playful and positive and is real life magic. Working with CSZ has been an amazing gateway to meeting amazing and funny women from all over the world. When you feel like the problem of representation of women in comedy is too real, it’s a salve to get to take the stage with these gals. I have been a part of Csz for coming up to 5 years and I love it because I get to say I am in a team. I never got picked for teams at school because I ran the other way when a ball came at me and I was frightened of hockey sticks. 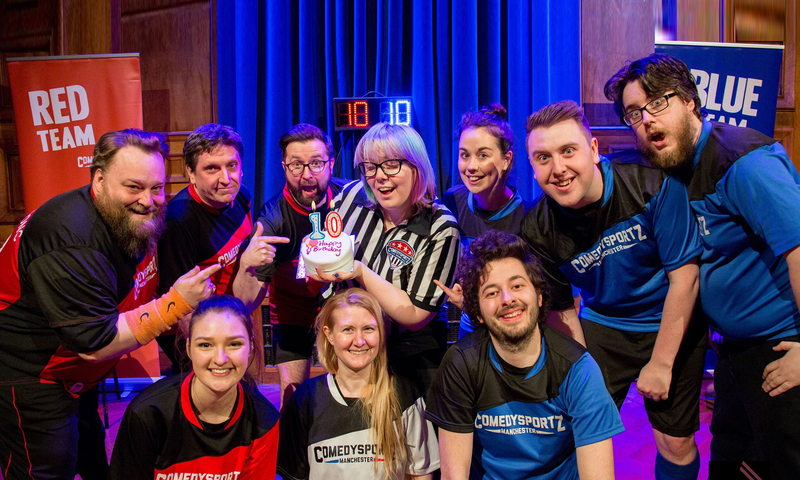 ComedySportz played an all-female team at the ComedySportz World Championships last year! There’ve been loads of great moments over the my two years with CSz. But the whole experience of the show in the photo was very surreal going from a regular customer service job at the time to performing in North Hollywood. Sometimes I have stints of feeling “am I even funny though?”, but the uplifting environment and scale of the event helped me make the most of the bizarre yet extremely fun moment. Josie is one of our latest recruits. See her at a show soon! I’ve just joined Comedy Sportz and am excited to be part of a female-run team that is full of witty women. I’ve been doing improv for five years, and it’s taught me to do so many things that women aren’t taught to do: to unapologetically take up space on stage and refuse to make myself small, to take on the ‘Professor’ role in a scene and cast another woman as the ‘Astronaut’, to not be afraid to be disgusting and monstrous when the scene needs that. I also think that Improv is one of the most accessible forms of comedy to women and non binary folks and should be celebrated for that. It breaks the macho mould of a lot of stand up with its focus on team work, support, and fun. This International Women’s Day may we continue to accept and support people of all genders. Happy International Women’s Day to all of the very talented women in ComedySportz teams worldwide and female improvisers everywhere! Want to see our players in action? Check out our shows page! Want to give Improv a go yourself and maybe one day join the ranks of funny ComedySportz women? Sign up to our upcoming Intensives today!